What I saw screamed unvegan at me and despite the disconcerting screaming, I know what I had to have. It was their Bacon Waffle & Eggs. Note the lack of a comma there, which meant that the bacon was a part of the waffle and not just a part of the meal. The menu elucidated a bit and claimed to have “crisp applewood bacon mixed throughout the batter.” Basically, it sounded like a dream come true for anyone in love with sweet, salty and meat. I ordered up my two eggs over easy to our incredibly friendly waiter and then waited for my bacon delight to arrive. Hair translates to free brunch. And when it came, it looked like a gift from heaven. At least until one of the others at the table pointed out a hair sitting on top of my eggs (thank the lord for the others). 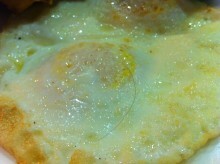 It clearly belonged to none of us table dwellers and the next time I saw the waiter I notified him of the hairy surprise. Not only did he play it off nicely, when he brought me my replacement dish he told me it was on the house. And then his manager came out and apologized for the problem. This stellar customer service not only redeemed the hairy surprise but the long wait surprise before being seated. Check out that central bacon. Now hairless, I dove into my dish with the fury of someone who hadn’t eaten a bite in 12 hours. 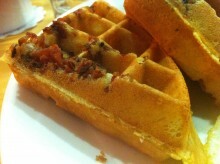 My fury was quickly sated by the awesomeness of the bacon waffles. This was not my first foray into the world of bacon waffles, but it quickly became my best. The waffle had been done up Belgian-style, which gave them a perfect fluffiness to contrast with the crispiness of the bacon. I am usually not a man to ruin waffles by adding the overwhelming sweetness of syrup, but when I added syrup to this waffle, the combination of flavors danced upon my tongue like a star. 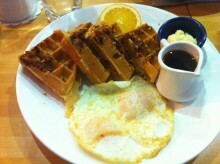 Then, as a kicker, the waffle took on even greater flavor when I combined it with the runny yolks of the eggs. If there were anything I would change about this near-perfect breakfast, it would be to get the bacon more evenly distributed in the waffle. As it was, the majority of that cured meat made its way to the center of the waffle as if compelled by some sort of Higgs Boson. Yet, that complaint is quite feeble, as Yolk did quite the job of treating me to an unvegan-worthy meal. If only all brunch could have the same ingredients and customer service, the world would be a much better place for me to eat at.